Splish Splash Splatter: Hot Air Balloons! 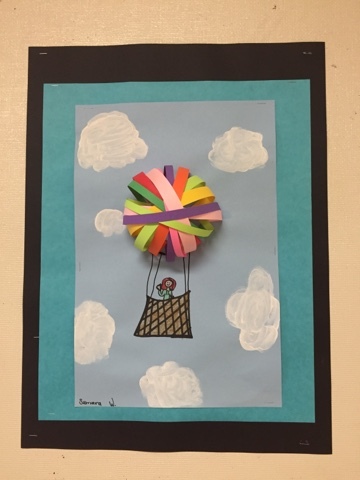 This was a fun project to do with my 4th Graders incorporating 2-D & 3-D art along with portraits. To begin the lesson, we reviewed what we know about the difference between 2-D and 3-D art and compared and contrasted the two. Next, I gave the students white tempera paint to paint their clouds on their blue paper. 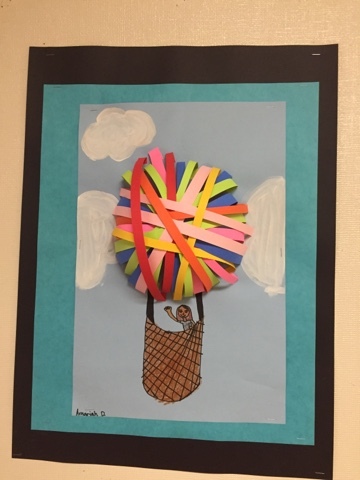 While that was drying, students drew the basket and worked on making their balloons. I demonstrated how to fold a small section of the paper strip at the end for gluing purposes and how to bend it to make an arc and glue the other side. Make sure to add lots and lots of paper strips so the balloons look full with no empty space showing. Last, the students drew a small portrait of themselves in the basket. I saved this step for the very end because even if they ran out of time for their person, their artwork would still look complete. I also know that if we would have drawn the person first, they would not have had time to finish their project. What a beautiful project! It's very delicate with strips of paper! I will share your beautiful project later in June on FB and Twitter!